This will guide you the screens for the sign up and payment process. If the email address match you will see a green check mark to the right of the input box. Retype in your Password again. If the Passwords match you will see a green check mark to the right of the input box. You may pay with a PayPal account, a credit card, or debit card. 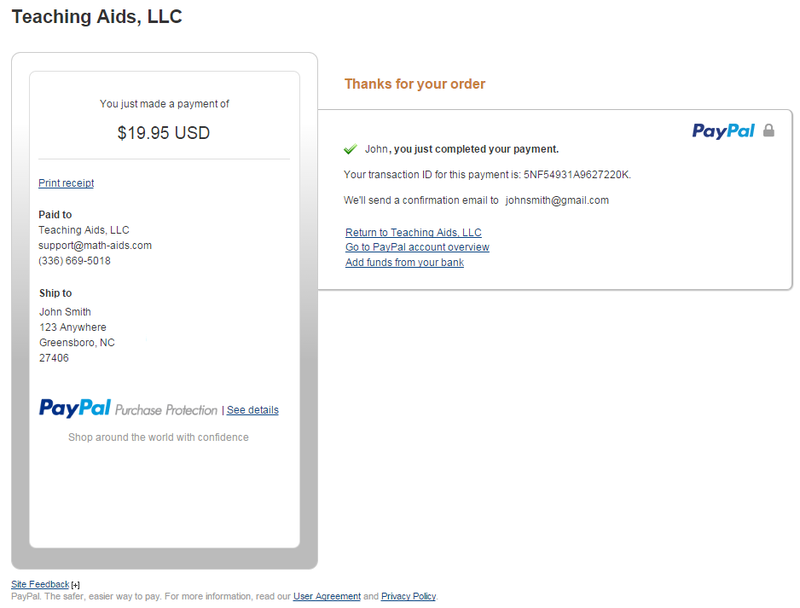 If you DO have a PayPal Account Click Here. If you DO NOT have a PayPal Account and Don't Want One, Click Here. If you have a PayPal Account you will see this screen. A) Area A will let you Log into your PayPal account and pay. 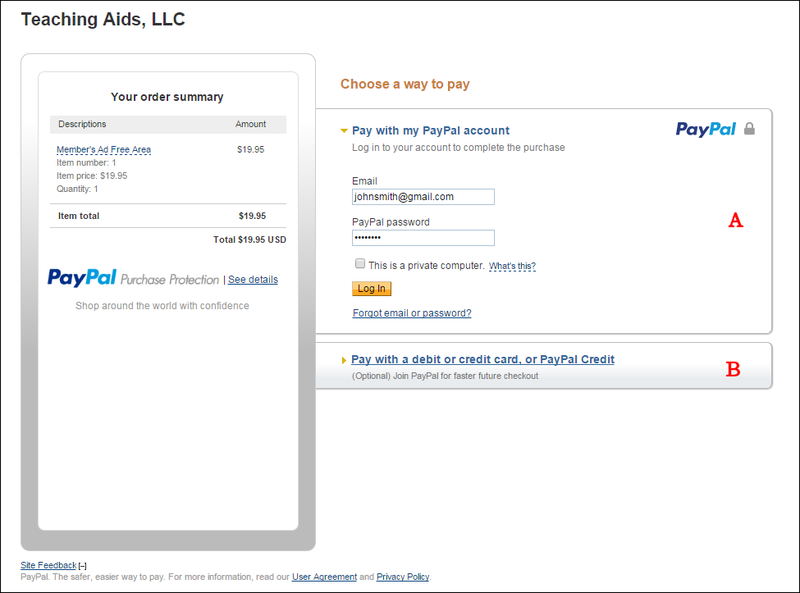 Log In and follow the directions with your PayPal account to make the payment. B) Area B will let you pay with your debit or credit card. Click on the Pay with a debit or credit card link and you will be taken to the Credit Card Payment Screen. 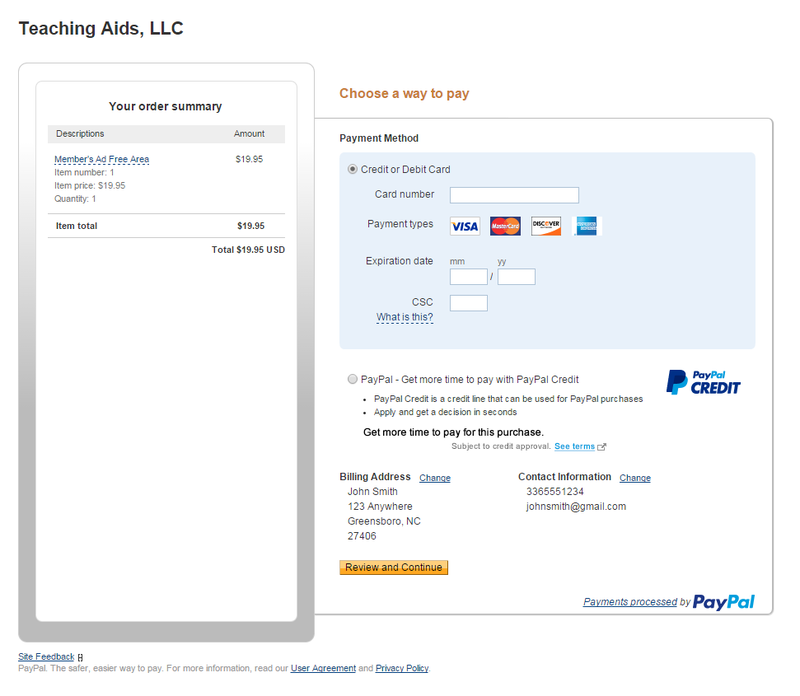 Enter the Card information and fill out the billing information and press the Pay Button. Print out the receipt for your records. Click on the Return to Teaching Aids,LLC link to go to Member Login Screen. 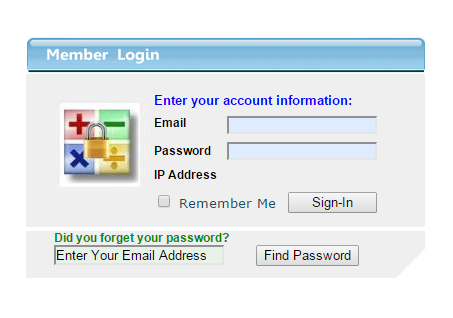 You will use your email address and password that you entered in Sign-up Form. Enter your Email and Password and press the Sign-In button. You will be granted access to the ad free area of the site. If you do not have a PayPal Account you will see this screen. Fill out the billing information in Area A and click Continue. 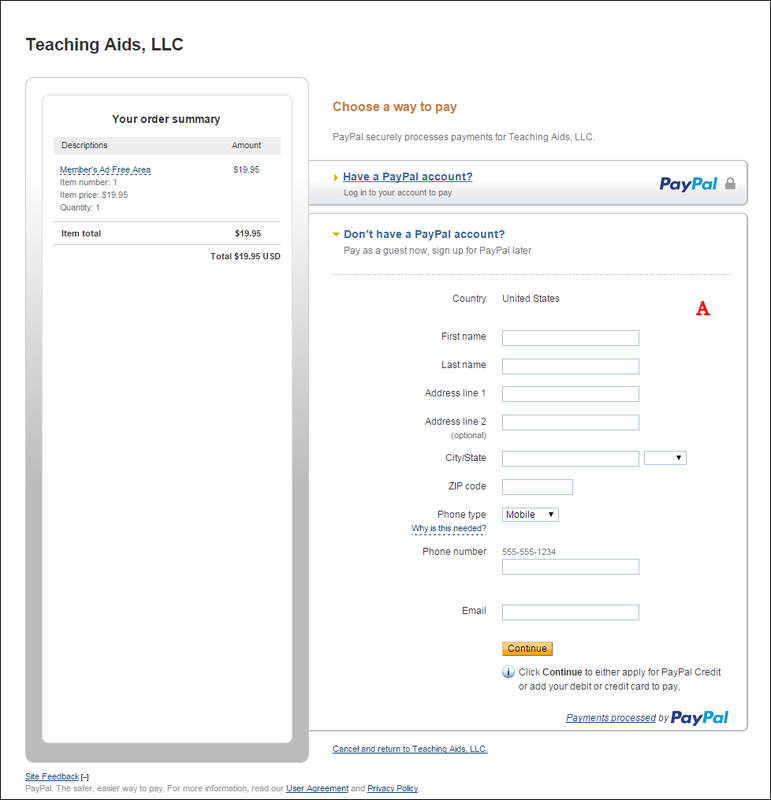 This is your billing information and will not create a PayPal Account. You will be taken to the Credit Card Payment Screen. Click on the Credit or Debit Card radio button. This will let you pay with your credit or debit card so you will not have to create a PayPal account. 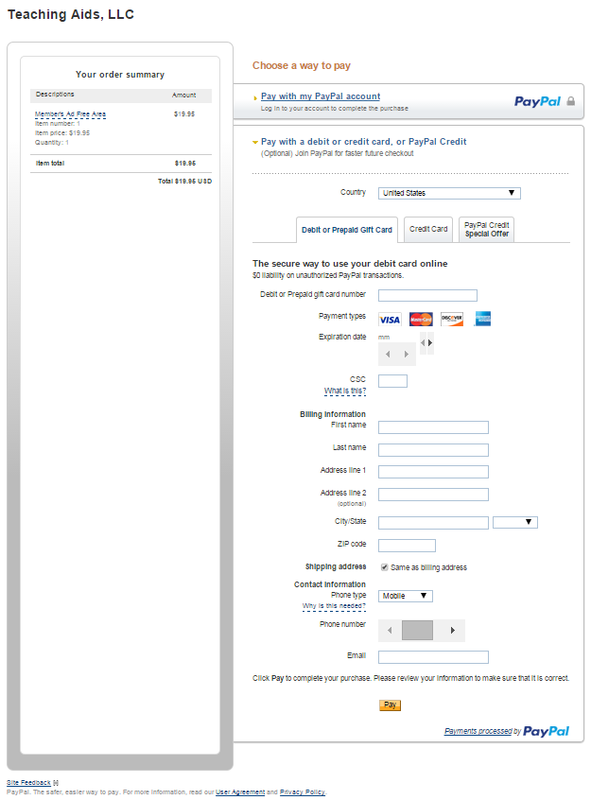 Fill out the blue credit / debit card area and then press the Review and Continue Button. You will be taken to the Review and Pay Now Screen. 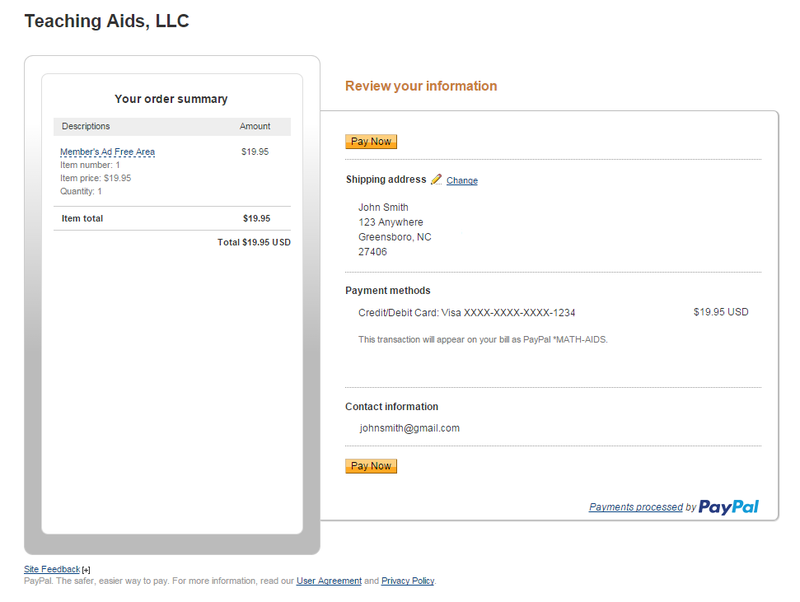 Review your shipping and payment information and press the Pay Now Button to make the payment. You will taken to the Thanks For Your Order Screen.